I actually quite like squirrels. I find them cute but I don't want them pilaging my bird feeders and frightening the birds. Bird seed can be an investment. So, there are many different feeders on the market that claim to be squirrel proof but this one seems to work the best with my research. It has 735 documented positive reviews that it works. 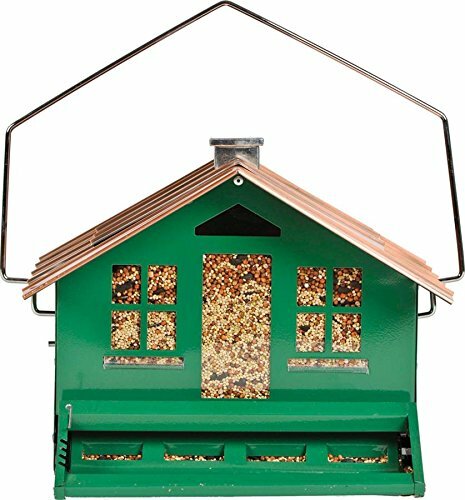 You can get them online at Amazon and as you can see by the picture it is hard for the squirrel to get at the feed. 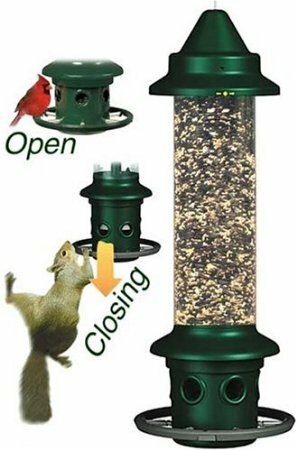 Another great tip that works for me, is to give the squirrels their very own feeder then you can have a very active backyard without any disagreements! Give them a peanut feeder or a place you can spread sunflower seeds. I like to have a low hanging feeder just for them in my garden and this way the shells become part of the mulch. No waste. I mean they are cute! I feed the birds, squirrels and chipmunks in my yard! Below are my Favourite styles for the birds and not the squirrels!! There are different ways to protect your bird feeders. I personally don't like the feeders with the cage around them because I worry birds will get trapped. So I have been giving my squirrels their own feeders which I fill with sunflower seeds in the shell that I can get quite cheap online or at the grocer store. It seems to keep them busy and away from my more expensive feeders and food. This way the yard works in harmony! Another option is to use stand alone squirrel proof poles that will work very well and this way you don't have to replace your present feeders. But make sure they are not under a tree as those pesky squirrels will simply jump on the feeders. I like the above squirrel proof feeders as they don't involve those cages, they tend to go by the fact the squirrel weighs more. Another enemy of my bird feeders is the raccoon. Last night I saw for the first time a large raccoon, simply bend the pole my feeder was on so as to snack on sunflower seeds. I didn't even realize they ate sunflower seeds in the shell. So I staked my feeder pole better and he has given up. You do have to get creative when it comes to feeding our fine feathered friends!